Handling of ballast water, especially ballast treatment, based on IMO requirements has significant impact on the efficiency of the vessel’s operation. 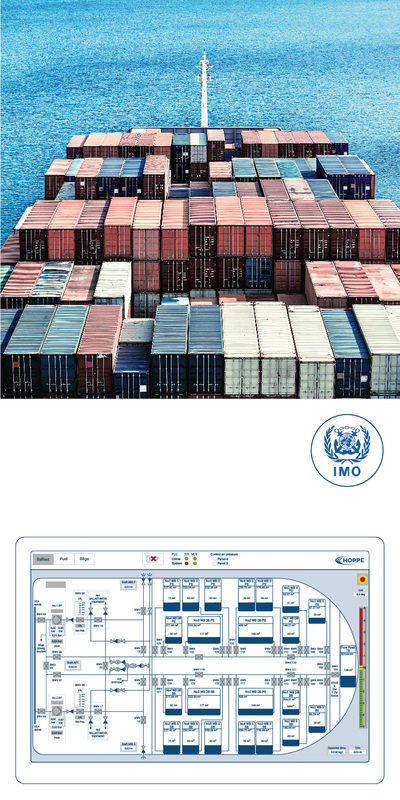 The Hoppe Ballast Management System is a sophisticated and user friendly software solution supporting all ballast water operations. The vessel’s loading case, stability information, hull stress and floating criteria, e. g. optimum trim can be considered to determine improved ballast operations. As a result ballast operations are proposed and supported by simulation routines which consider the vessel’s stability criteria during the ballast process. The system provides ballast operation job lists which can be forwarded to Hoppe’s Valve Remote Control System for automatic or manual source target control. Ballast operation reports using data from pumps, valves, tank contents, treatment unit and GPS coordinates round up the scope of supply. Hoppe Marine provides assistance to ship owners for optimized retrofit solutions of ballast treatment systems on running vessels, based on our long term experience in overall ballast management systems. Support is given for selection of appropriate treatment system, integration concept into existing ballast systems considering optimized installation costs and adaption of Hoppe Valve Remote Control system. Hoppe provides a comprehensive ballast reporting based on data from pumps, valves, tank contents, treatment units as well as GPS coordinates. It covers all ballast operations from treatment units, by passes or other internal ballast water sequences. As result an automized digital ballast book report can be generated.